A Labour MP has been named as the first beneficiary of a planned “progressive alliance” in which the Green party candidate stands aside in an attempt to keep the Tories out. 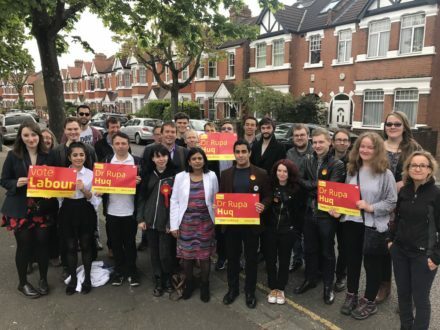 Rupa Huq, who was elected with a 274 majority in Ealing Central and Action in 2015, has won backing from the rival Greens because of her vote against article 50 in parliament, her backing for electoral reform and her opposition to Heathrow expansion. At the 2015 general election, the Green party received 1,841 votes, just 3.6 per cent, in the West London seat. Voters there heavily supported Remain in June last year when 72 per cent favouring continued membership of the European Union. “The local Green party knows that I am a resolute Remainer and that, if necessary, I will continue to break any and all whips to fight for the UK to stay in the EU. In these perilous times it is vital that we work together to oppose this reckless surge towards Brexit,” Huq told The Observer. The MP also urged the Liberal Democrats to consider standing aside, so as to not split the pro-EU vote in the bellwether seat.